What’s Your Implementation Strategy for the CHNA? You may be finishing the Community Health Needs Assessment and starting to think about the Implementation Strategy. The final IRS guidelines issued in December 2014 extended the due date of the Implementation Strategy to be on or before the 15th day of the 5th month after the end of the taxable year in which the CHNA was conducted This means a fiscal year end date of June 30, 2016 would be required to have the Implementation Strategy approved by November 15, 2016. Develop a process and criteria for how your hospital will select which health needs it will address in the Implementation Strategy. The Implementation Strategy is not limited to address only those health needs identified in the CHNA. It may also describe activities to address health needs the hospital identified in other ways. The Implementation Strategy must be approved by the hospital’s authorized governing body. While there is no specific IRS guidance on the process of obtaining public comment on the Implementation Strategy (other than including it in Form 990 filings), the IRS guidance does require input from the public. The guidance notes that hospitals should include written comments on the most recently conducted CHNA and Implementation Strategy. To comply with this requirement a hospital may wish to develop a process to obtain public comment on the Implementation Strategy. Click here to check out the CB Connect section on the Implementation Strategy! Do you have questions about the Implementation Strategy? Join Melissa Biel for a Live Q&A on June 23, 2016, 9-9:30PST / 12-12:30 EST. This is a live phone call to answer your questions. Register here. On May 4, Community Benefit Connect hosted its second annual networking convening for community benefit professionals. 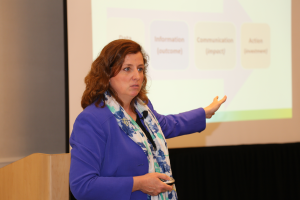 Val Agostino, Senior Vice President, Community Impact & Healthcare Partnerships, from Mercy Housing presented how hospitals are investing in housing to improve health. Anita Zamora, COO, from Venice Family Clinic discussed the Westside Health Access Project, an innovative endeavor that links hospitals, the Venice Family Clinic, and community social service agencies to successfully manage patients who are frequent users of the ER. Bridget Hogan Cole, Executive Director, Institute for High Quality Care spoke on Measuring the Impact of Community Benefit Programs. Speaker slides from the convening are posted here. We hope you can join us for this event next year! The Governance Institute, in partnership with Stakeholder Health, and the Public Health Institute (PHI), and with support from the Robert Wood Johnson Foundation, is implementing a national strategy to accelerate population health capacity among health systems. Dr. Kevin Barnett, Senior Investigator for PHI and community benefit expert, will lead this strategic program and will be joined by a distinguished group of faculty. Senior hospital executives and board leaders are encouraged to participate. The next program will be held October 29 – 30 in Nashville TN immediately preceding the Governance Institute’s October Leadership Conference. This program is supported by a grant from the Robert Wood Johnson Foundation. As a result, there are no registration costs for participants. Participants are responsible for travel, accommodations and related expenses.